Wheeler is the author of numerous short works and has published two prior books -- the short story collection "Bad Faith" (2016), and the chapbook, "On the River, Down Where They Found Willy Brown" (2015). 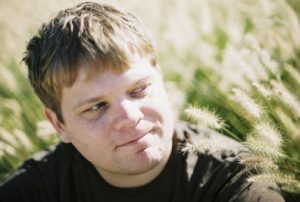 He’s won a number of awards for his writing including the Tarcher/Penguin Top Artist Award for an in-progress version of "Kings of Broken Things." Wheeler talked with us about his work, Omaha history, and a couple of recent must-read titles that he would recommend to others. Tell us about your new book, "Kings of Broken Things." Set in Omaha during the end of World War I and the Red Summer of racial strife that followed, the book follows a group of young immigrants and outcasts through the events of the Omaha Race Riot of 1919 and lynching of Will Brown. Karel Miihlstein is a displaced Austrian boy whose natural talent as a baseball player connects him with the rough men of the neighborhood team; Jake Strauss finds himself mixed up with political-criminal machine leaders who find use of his charisma and violent nature; and Evie Chambers is a kept woman searching for a way out of the underworld before it's too late. The book dramatizes real events from the city's history and fictionalizes notable figures like Tom Dennison and Josie Washburn, so it was a lot of fun to research and write. This is your first novel. Did you learn anything new about writing, the publishing industry or even yourself during the process? My first kid was a baby when I started working on the book, so in a lot of ways I grew up during the writing process. It's crazy to think how she's going into fourth grade the same month that Kings will be published. To be more specific than wistful, the biggest thing I learned is to better balance what I want to write with other expectations and the needs of a potential audience. As a younger writer, it was just about trying to tell a good story. It was hard to keep up, there's so much to think about. By now I feel more comfortable with what I do and try to focus more on crafting a more gratifying reading experience. Hopefully readers find the book to be inviting and interesting, and the writing generous. "Kings of Broken Things" is set during the Omaha Race Riot of 1919. What drew you to this time in Omaha’s history? For the last 10 years, I've worked as a reporter for a news service and covered a beat at the Douglas County courthouse, which, of course, was the site of the race riot and lynching. I'd first heard of the riot when I was in fourth grade, growing up in Lincoln, and it has stuck in my mind ever since. Spending so much time at the courthouse, it was something I thought about almost every day while walking the halls, stairs, and surrounding neighborhood. Beyond that, it was such a chaotic and inventive age, notably in art, technology, and transportation. The grief over World War I was experienced over this backdrop in such an expansive way--this notion of the "war to end all wars," that it was so abominable that it couldn't be repeated. This feeling was echoed in Omaha after the lynching of Will Brown, by the way, that the tragedy would spur society to improve and never repeat its mistakes. Given that context, it's troubling to think that the U.S. has been at war my entire adult life. Following World War I, you see a lot of intense examination of the psychic damage war causes. These similarities in the art and culture of the era are attractive to me and my art, and the time is still recognizably Modern in other ways too. Like most historical fiction, it’s a convenient way to think about our own times. "Ladivine" by Marie NDiaye (translated by Jordan Stump) is great. A dark, absurdist take on middle-class life in France that's told as a multi-generational psychological drama about shame, race, and post-colonial violence. It's so gripping, complex, and moving. Right now I'm reading Lydia Peelle's new World War I novel, "The Midnight Cool," and loving it. 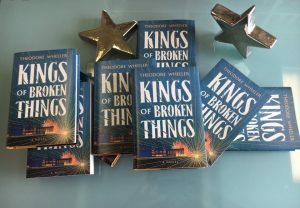 "Kings of Broken Things" comes out on August 1! I'll be busy promoting the novel this fall with more than a dozen events scheduled so far, including Pageturners Literary Pub Quiz on August 2, The Bookworm on August 6, and a local author cocktail party with the 1877 Society at Mercury Lounge on August 23 to benefit the Omaha Public Library Foundation. Other than that, I'm working on a new novel that's set around the safe haven child custody crisis in 2008 that deals with loves lost and abandoned. Thanks to Theodore Wheeler for taking the time to answer a few questions. Check out his website for information on his upcoming events and projects.